The October edition of Wood News is out and ready to read. This month we’ve got an exciting announcement about our one day sale and our special guest – if you’ve ever wanted to see hand cut dovetails demonstrated in person by the master, our fall one day sale is the place you’ll want to be! And for those of you who can’t make it to Atlanta this month, we’ll miss you, but we hope you enjoy all the great things this month’s Wood News has to offer. Steve Johnson, our Down to Earth Woodworker, has finally finished his garage-to-workshop conversion. He has a new column this month as well as a new video with an excellent workshop tour that will inspire all of us to go look at our shops and figure out what we want to improve next. We’ve got all new Show Us Your Shop, Show Us Your Stuff and Show Us Your Woodcarving columns as well as a feature from Andrew Sawyer about making your Wood Slicer bandsaw blade work even better! And speaking of the Wood Slicer, one of our customers sent in these amazing photographs of his first experience using the Wood Slicer bandsaw blade – we are impressed! Add to all that three new product tours from Morton, including one on the ALL-NEW Leigh R9plus joinery system, and you are sure to find something you’ll like in this issue. 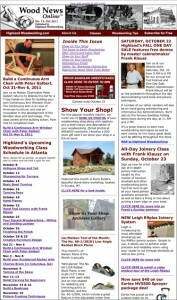 So take a look at the October Wood News, and enjoy! Call For Help: A Fellow Woodworker in Need New Product Tours for October: Rikon Bandsaw Comparison, Sharpening Card Scrapers and the ALL NEW R9plus Leigh Joinery System!